We usually give a new restaurant a few visits before reviewing, but this place caught our eye on a cold Friday night. 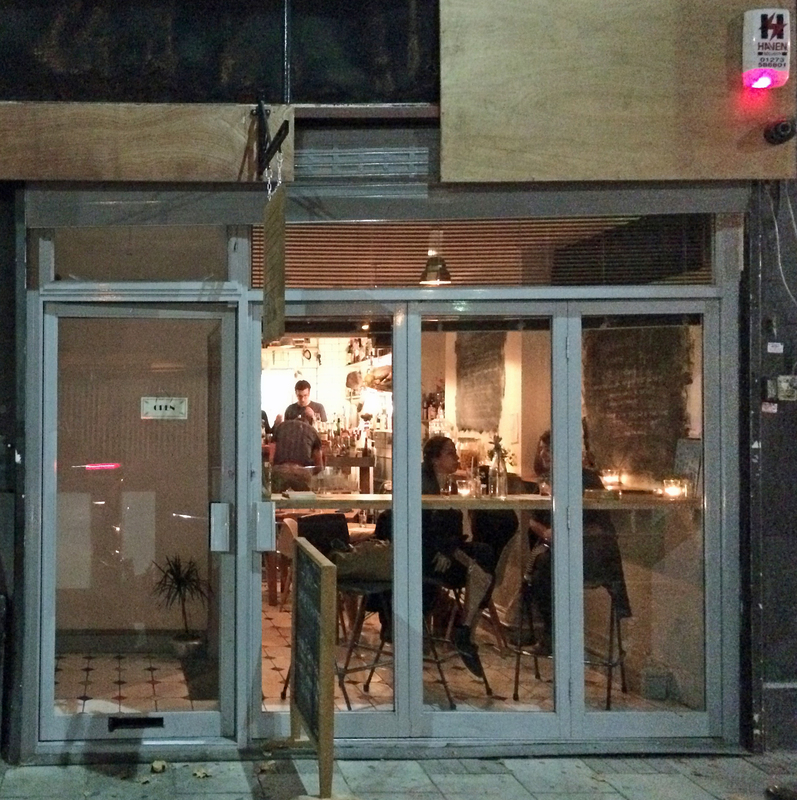 They were in their “soft launch” phase – the whole kit and caboodle will be open tomorrow (Tuesday 16th October), when it will have a longer menu including desserts. 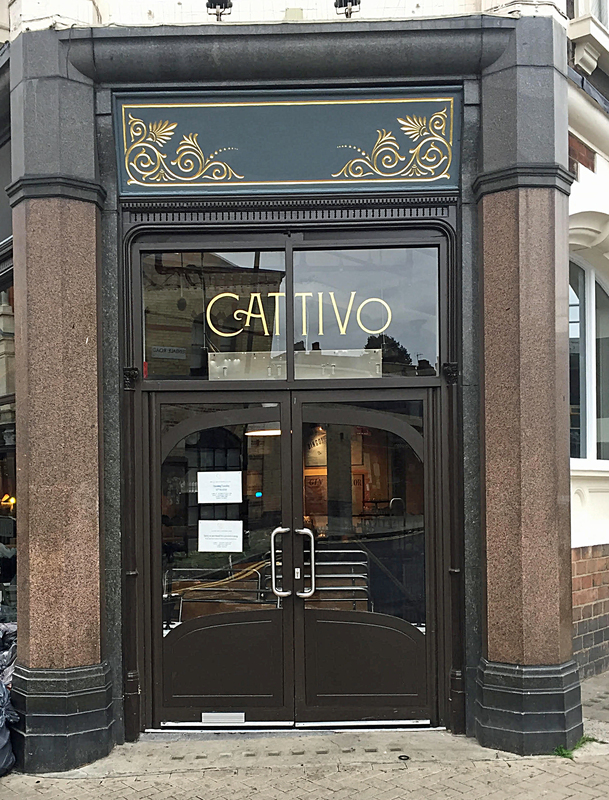 It is part of the same chain as Canova Hall (link, link and link), which is just across the road. This is a restaurant and bar also but takes a slightly different approach to decor. Gone are the cosy banquettes and the French Bistro feel, but what is left is the same industrial style, with lots of room for standing and drinking. 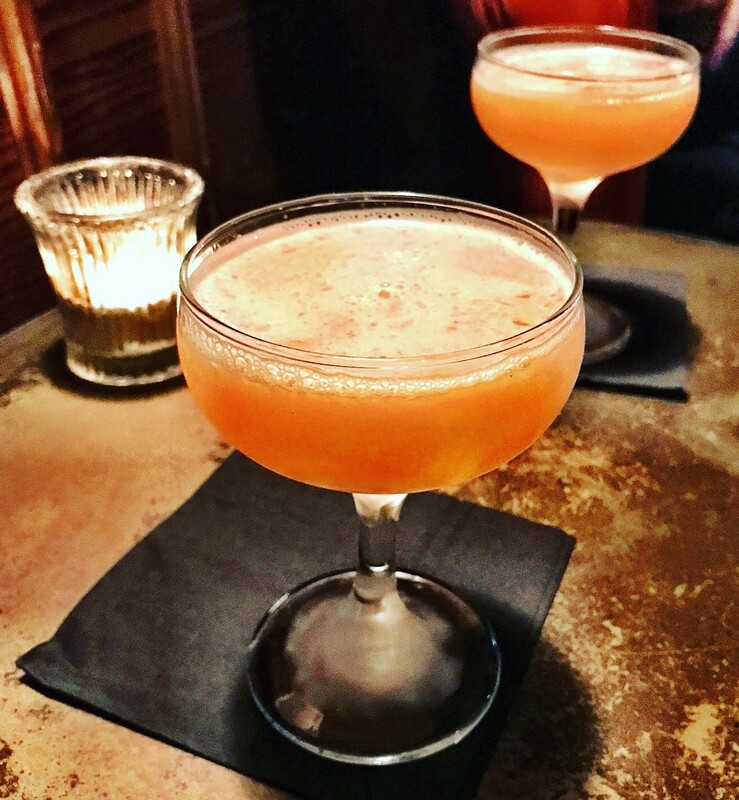 Downstairs (and yet to be explored) is a cocktail bar with its own Gin distillery. But we visited for the food, although by way of a cocktail and glass of wine. Food on the menu was hearty, and with large proportions it will certainly line your stomach for the Friday night revelries and probably divert any potential hangover. Menus online seem to be more extensive, with some sharing plates. The foreshortened menu consisted of spaghetti and meatballs (beef, spicy pork and ricotta), a vegan dish and some fried items including potatoes, squash, peas, parmesan fries and focaccia. 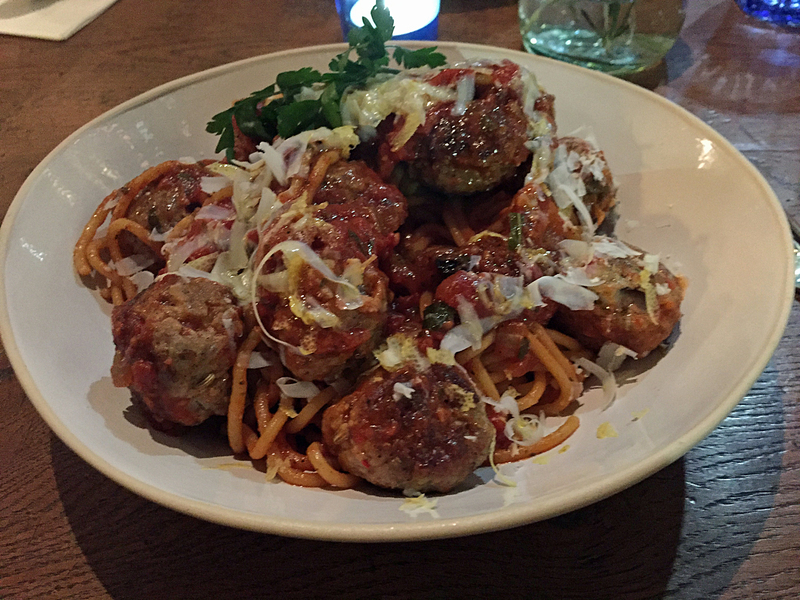 We settled for spicy pork and ricotta meatballs, and although we thought about ordering a side dish, we were glad we hadn’t when we saw the size of the plates of pasta. The spicy pork was spicy but not overpowering with some chili in the tomato sauce too. We missed the promised gremolata but liked the taste of the sicilian sausage. The ricotta meatballs were much softer than the beef but equally tasty. We missed the gremolata again and wondered what the ricotta salata was (advertised on the menu). We did have cheese and they didn’t offer any extra Parmesan. But I don’t think either of us minded. We washed all this down with water and a glass of Primitivo and a Professore cocktail (Del Professore Madame gin, Kamm & Sons aperitif, Campari) – so a sort of Negroni with a large ice cube and we were glad to see the absence of a straw. A clever engineering touch was the shaved orange peel jammed into the side of the ice cube thus successfully preventing it from freezing your top lip during drinking. We would like to congratulate the barman (or woman) who invented this – patent it now. We paid £42 including the drinks which were almost half the bill. We have another booking for Friday to try some of the other specialties on offer. Address: 336 Coldharbour Lane, Brixton, SW9 8QH. 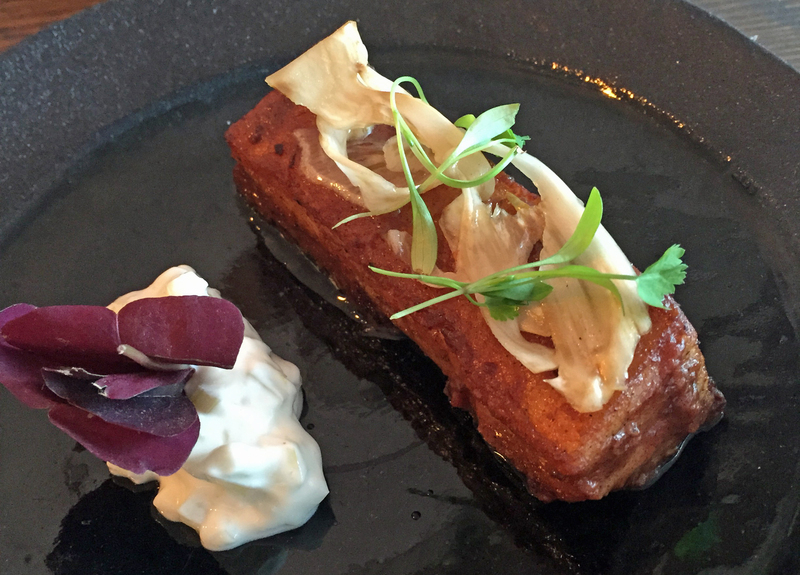 Our normal approach is to keep you in the dark about what we think about a restaurant but we are breaking with this practice to tell you that Oxalis (the current pop-up caterers at Shrub and Shutter) are brilliant and we are not usually so enthusiastic. It’s not complicated food but it is imaginative with a focus on flavour. We have reviewed the cocktails before; see here, here and here. But on this hot and steamy night we went for wine and beer. There are lots of things to choose from but we cut out that difficulty by choosing one of the tasting menus. There are two – one veggie and one with meat. We had the meat option. On top of this we were given an “amuse bouche” (aren’t we posh) of a warm squid ink cracker with dark crab meat topped with a lardon. Now you get the way this is moving. 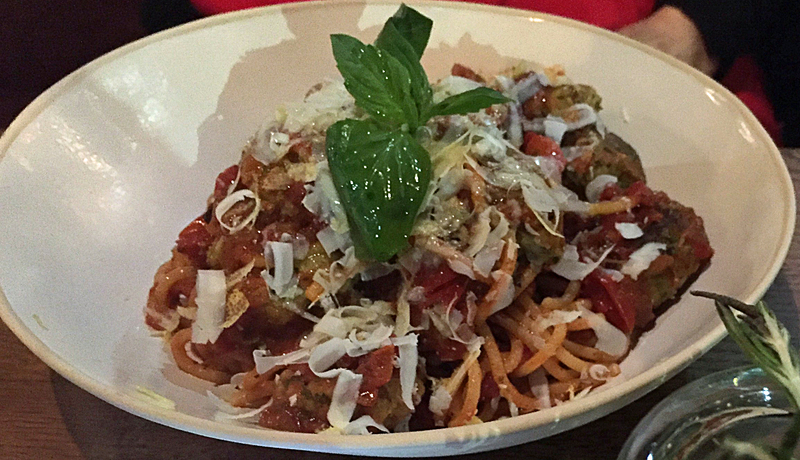 It was delicious – so delicious that it was eaten before we could take a photo. 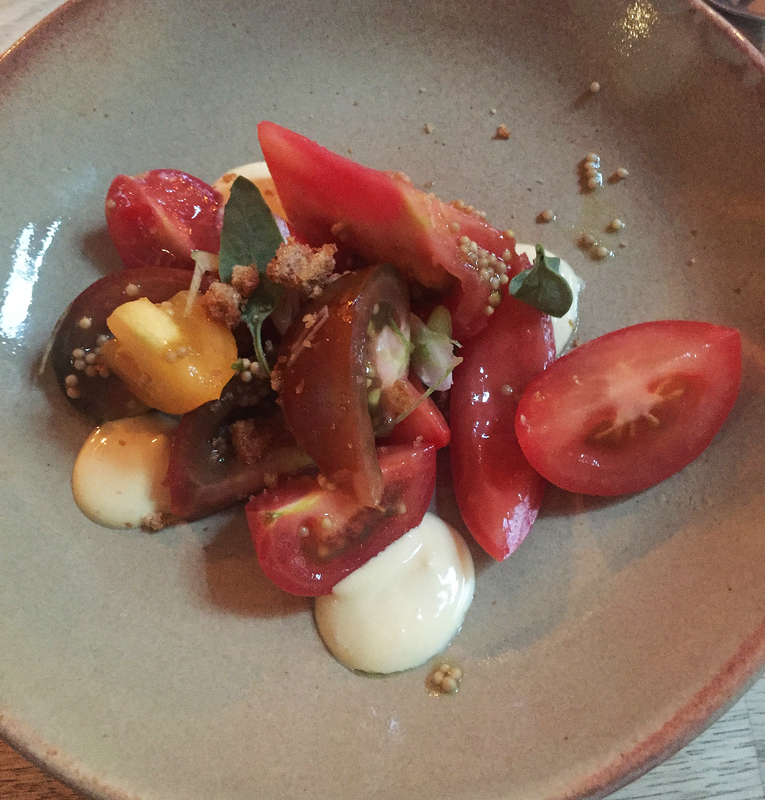 Then we moved on to the main menu – a delicious tomato salad with elderflower and mustard. I am soon going to run out of superlatives as it was the best thing to start us off – fresh with little bursts of mustard flavour. All four of us were delighted. 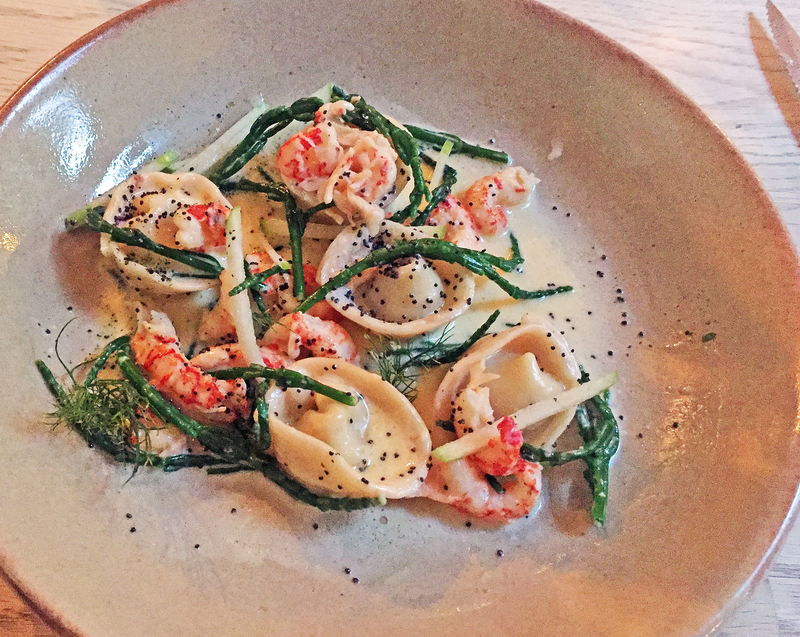 Fennel tortellini, poppy seeds and crayfish – even though these are tasting menu portions there was definitely enough crayfish. So just sublime with a crunch. 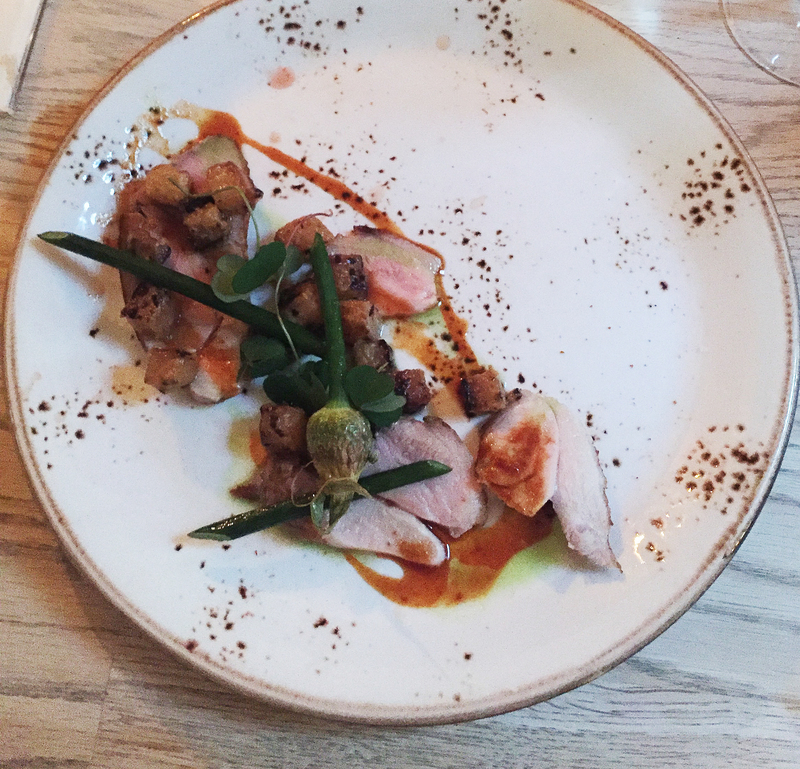 Pork, kohlrabi and sea buckthorn came next- sounds interesting and it was but also excellent. The empty half of the plate left room for some vegetables; new potatoes and grilled gem lettuce as shown in the photographs, plus some mange-tout. 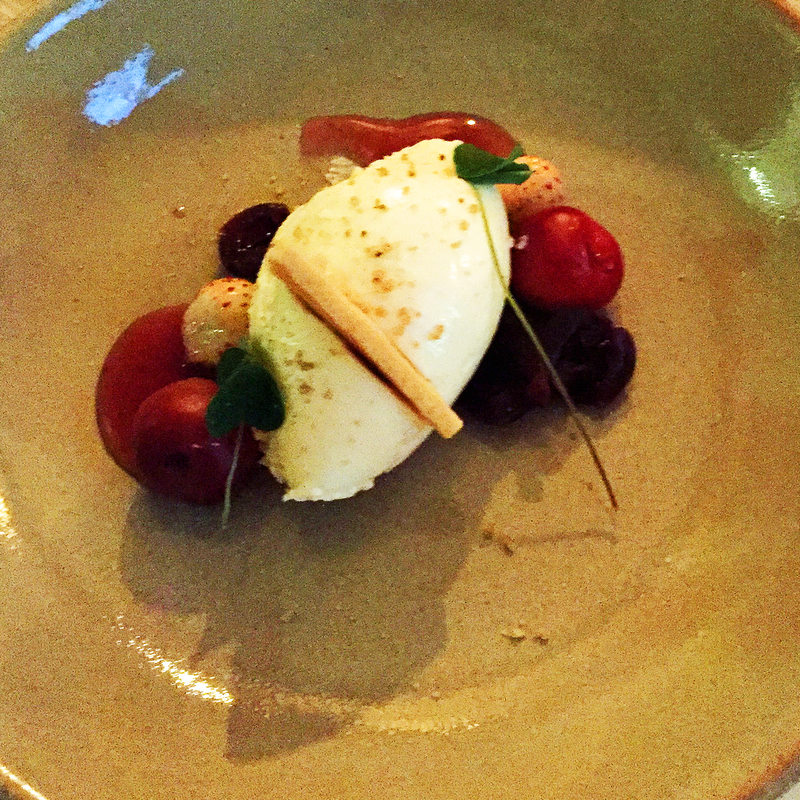 The simple dessert was cherries, cream and a garnish of the eponymous oxalis (Google just said it was an edible weed, which doesn’t sound very appealing, but most of you have probably heard of wood sorrel). All this flavour and innovation for £30.00 a head. The bill of was larger, of course, as it included our wine and beer. As we were celebrating in company we didn’t stint ourselves, although I paid for it with a hangover. Oxalis popped up in Shrub and Shutter just a month ago. It will be around for another 4 or 5 months but don’t waste any time – go and eat as soon as you can. 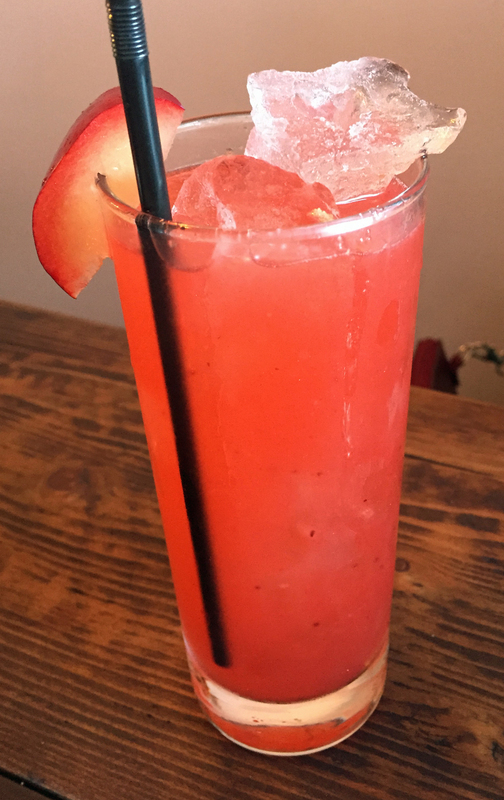 This is a review mainly about cocktails but it includes the food too. I have relied on my dinner companion and photographer to nudge my memory. I hadn’t seen this friend for a long time, so we decided to celebrate in the Fox Bar before eating. So, as we didn’t want to appear too eager we arrived at 5.10 (it opens at 5). We were the only customers but it was relaxed and the service was fantastic. We have covered here before (see here) so this is more of an update. After ordering a couple of cocktails (Earl of Gimlet – Gin- Bergamot – Grapes), we were then offered free celebratory glass of Bollinger by one of the bar staff, as it was his birthday present. Then we had another couple of rounds of cocktails (Reynold Reserve – Tequila – Islay Whisky – Apricot and also a Red Hook – Rye Whisky – Bitter – Maraschino). We well and truly tested the drinks menu! – all drinks were great, not too sweet and very aromatic. Feeling peckish and not being able to make too many choices, we ventured only a few feet away to the restaurant, where surprisingly we were not the only one’s present. 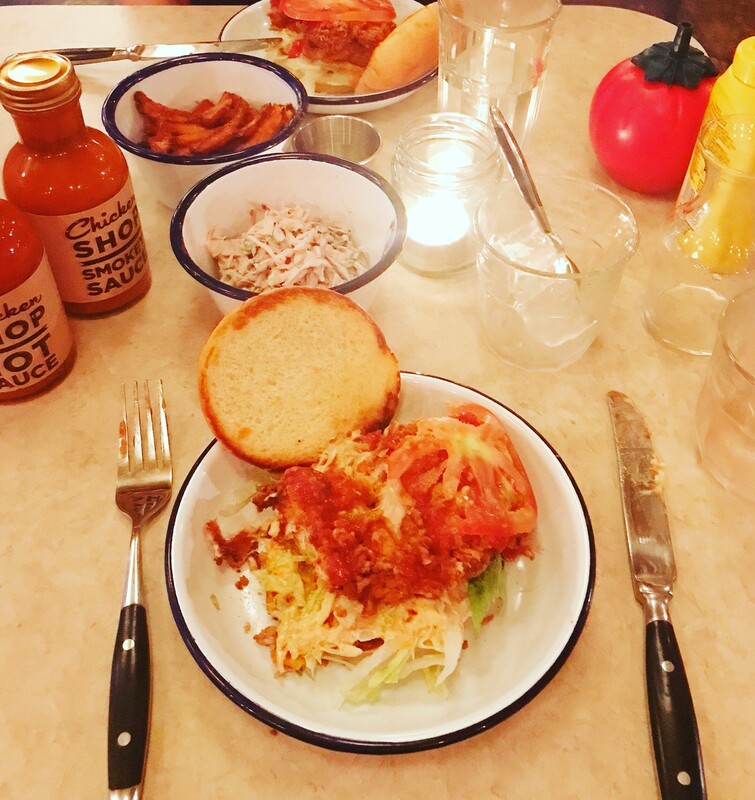 We each ordered a Dirty Burger (succulent deep fried chicken in a burger bun) and both of us were converted – deep fried chicken is a real winner. The meat was succulent, not too much sauce and anyway you could ask for more of the hot stuff. 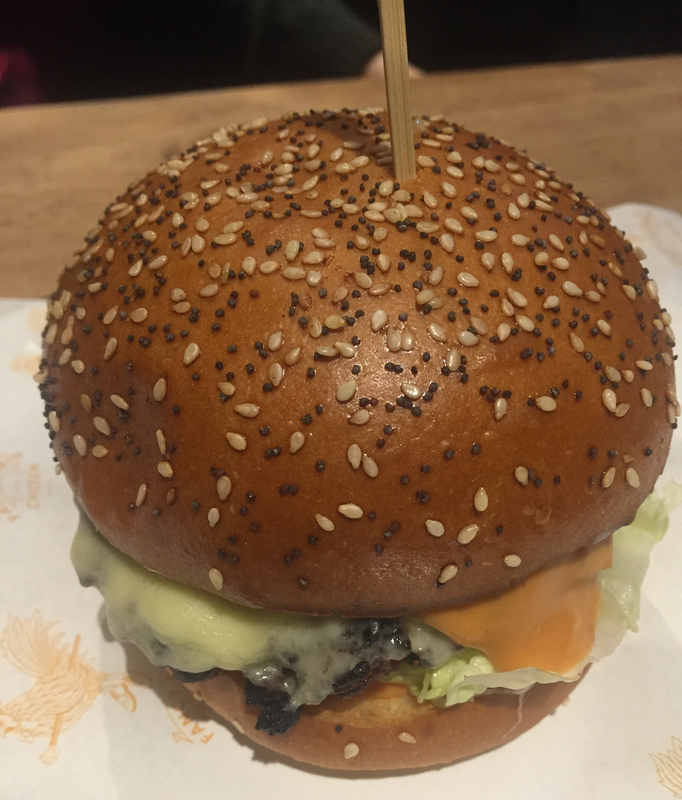 We both decided the bun was superfluous but the crunchy greens were really enjoyable and made us feel healthier. My memory from thereon is more than hazy, we moved onto another of our favourite bars in Brixton (Three Eight Four), where our taste in cocktails diverged with my friend opting for a dry Gin Martini and I went for a classic Vesper. The mixologist did us proud producing two very good classic cocktails, although by this time I’m not 100% sure either of us were in any fit state to call ourselves a connoisseur I think two Vespers/Martinis contributed to a staggering walk home and I have now downloaded the Drink Aware App and trying to stick to 14 units a week. A more purist lifestyle will also help with the credit card bill. The advice from two people who should have known better is, go to Chickenshop but a beer is all you will need for a good night out. 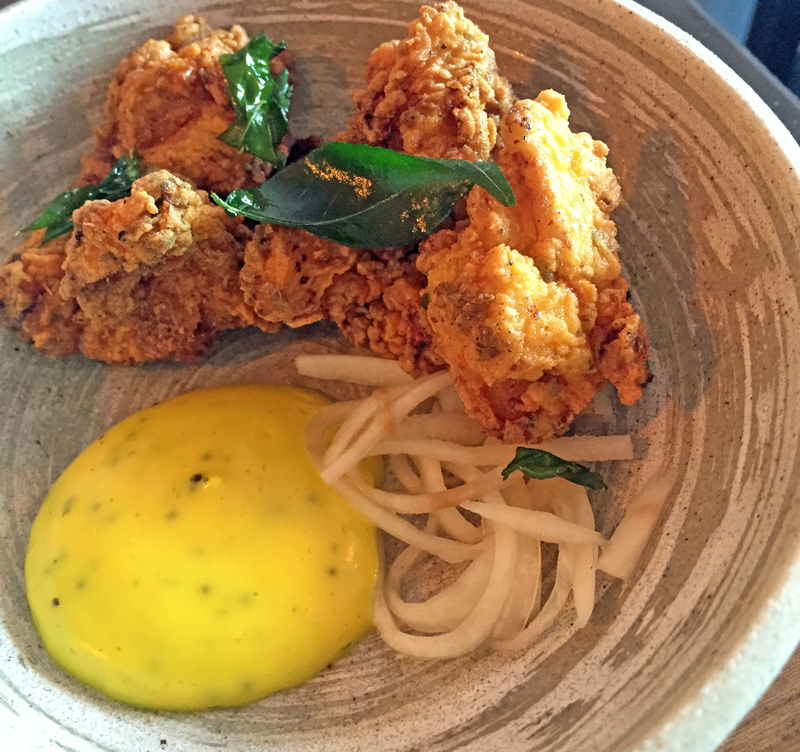 This new place, only opening in September, describes itself as a late-night chicken shop, serving a southern American spin on fried chicken, along with a dedicated cocktail menu. It will also host a range of DJs every weekend but this probably means in the evening. On Sunday lunchtime we just enjoyed listening to the background music, which was mostly classic soul. For old Brixton hands this is, of course, the premises occupied by the much-missed Phoenix Café, a classic ‘greasy spoon’ of long-standing, before it moved further down the street and then vanished. It was always rather poky and, even following a total reconstruction from the foundations up, it’s still on the small side. There are some cosy four seater booths on one side, opposite the bar, but most of the seating is on stools at high bar tables. It’s also a little on the dark side, which I suppose gives it some atmosphere. I’m not sure what constitutes south American fried chicken and the food on offer is pretty Brixton generic – i.e. much like stuff you can now get at many other places in Brixton. There are the inevitable chicken burgers; crispy fried chicken wings of course, with a choice of sauce varying only in how spicy hot they are; and, somewhat randomly, waffles. If this place is going to succeed it needs to stand out by the quality of the food, rather the uniqueness of what’s on offer. One plus is that the meat comes from ‘free range happy chickens’, although quite how they know the chickens were happy is unclear. I had the chicken wings with the middle-ranking sauce, described as “having a little kick”, which was quite hot enough. 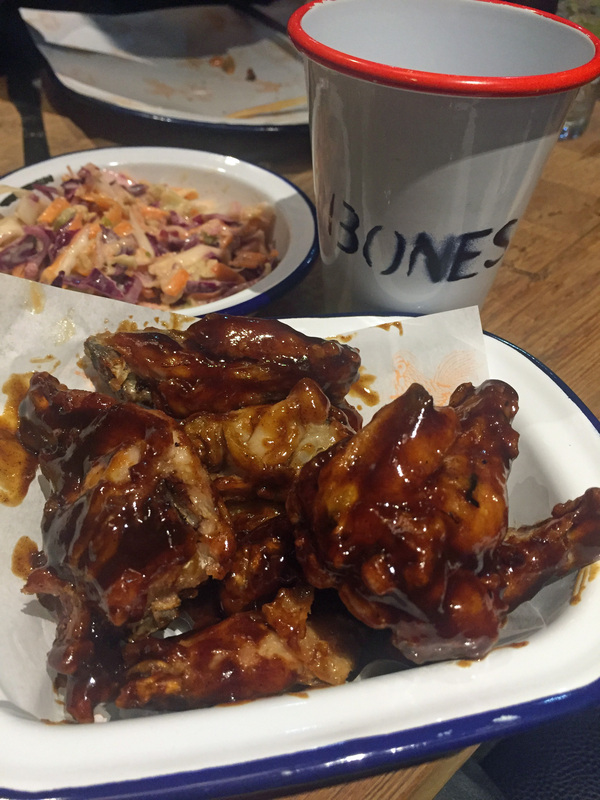 The wings were oddly small but properly crispy, despite being served smothered in the sauce. I chose the smaller serving size, supposedly six, although there were more. 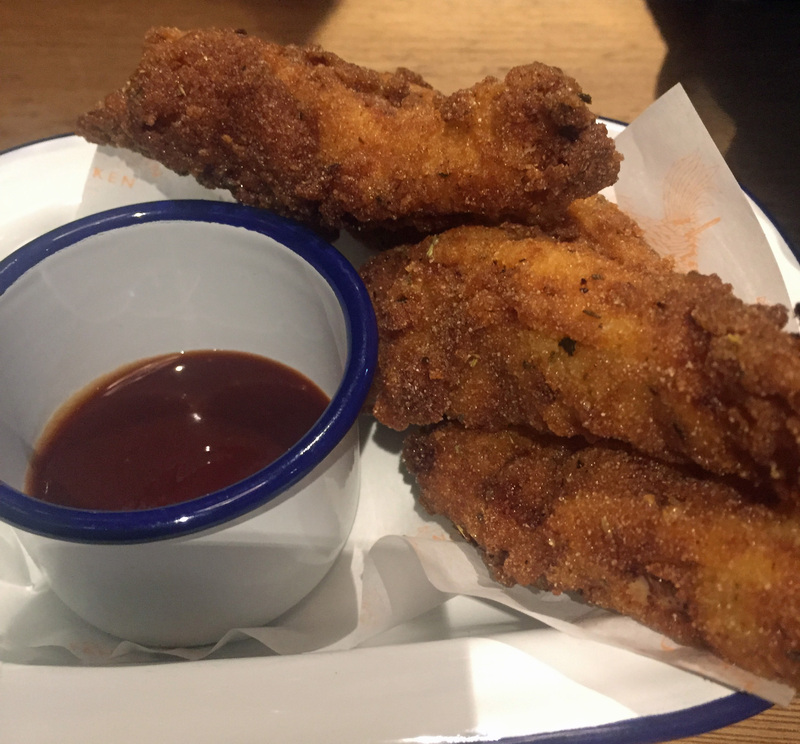 The third choice was boneless chicken pieces (chicken nuggets in other words), served deep fried in breadcrumbs with a “secret spice mix” and BBQ sauce. The sauce was given a positive review, with a deep savoury smoky taste, although the chicken itself wasn’t really as interesting as it should have been. For sides we had a portion of fries, a dish of coleslaw and waffles. 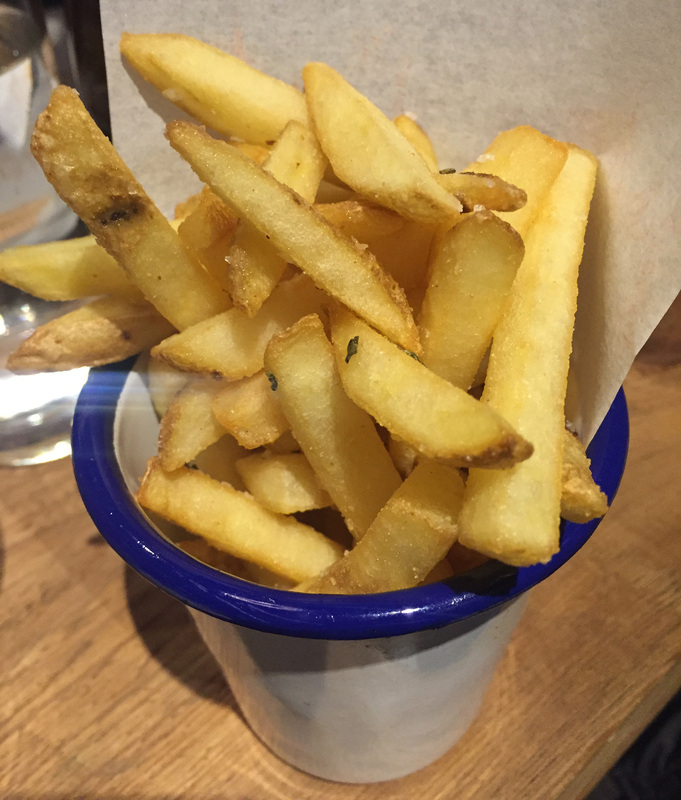 The fries were fine, if not outstanding; the coleslaw was as we like it; and the waffles were a bit odd, mainly because we were expecting savoury potato waffles, but were served ones made with flour and served with a sweet sauce. The portion size of the sides cannot be described as generous but, in the event, we had plenty to eat. The service was attentive and appropriate action was taken when there was a delay due to a problem with the waffle machine, i.e. we were given our drinks (passionfruit juice, ginger beer and a coke) for free. We passed on a pudding (a limited choice), as well as cocktails, (a good choice). Altogether, without the drinks, the bill came to £30.50 before adding a tip.There’s been a suggestion that Brixton is becoming a giant food court and this places fits into that model. 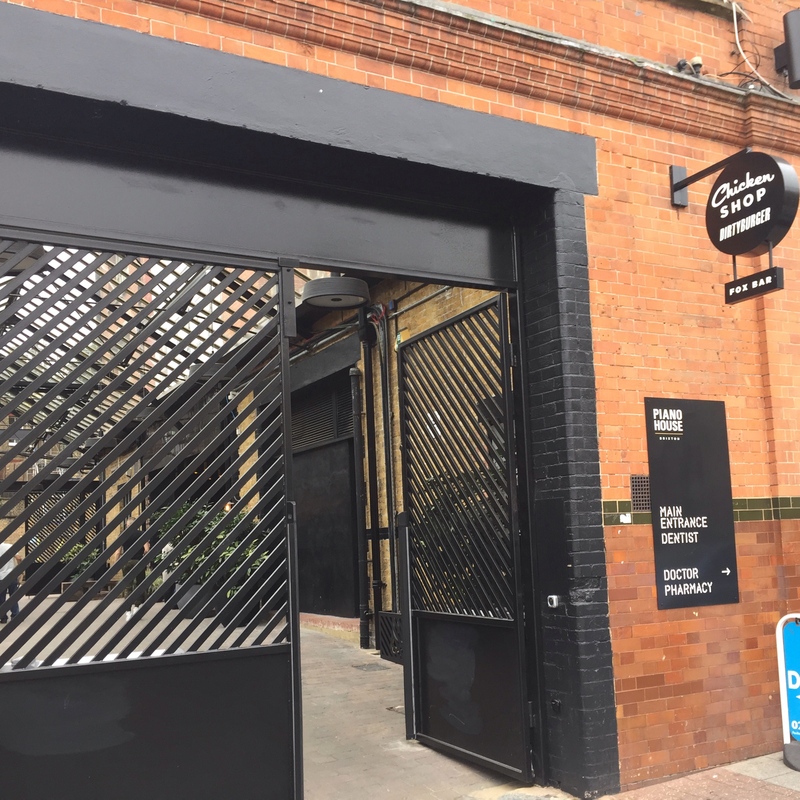 It’s going to have to work hard to develop its own identity as a food destination, or else it’s going to end up as just another place to have a drink and socialise. This is on the second floor of Pop Brixton – the arrangement of storage containers near the Recreation Centre. It is a narrow corridor of a restaurant with just one line of tables with bench seating inside for about 20 covers but there is more space outside in clement weather. It is open 6-11pm Monday to Thursday but opens at lunchtime on Friday to Sunday. Kricket offers Indian small plates served with cocktails, so I suspect they do not expect you to stay long. 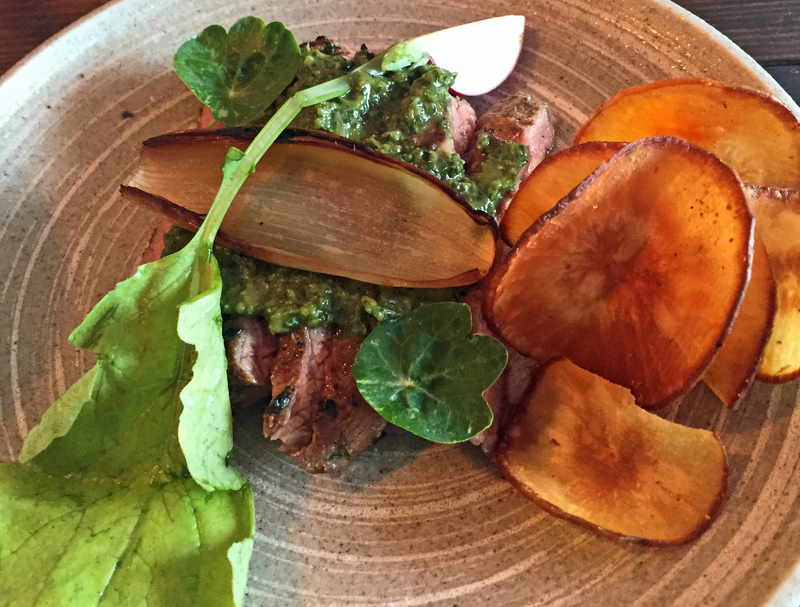 The menu is short and the expectation is that most people will chose three – but we managed with two each and felt that was sufficient when we left. We chose Bhel Puri which has raw mango; Samphire Pakoras; Keralan Fried Chicken; and Vindaloo Bavette. The Bhel Puri was fantastic and lives up to the one we had at a knowledgeable friend’s house a little while ago. 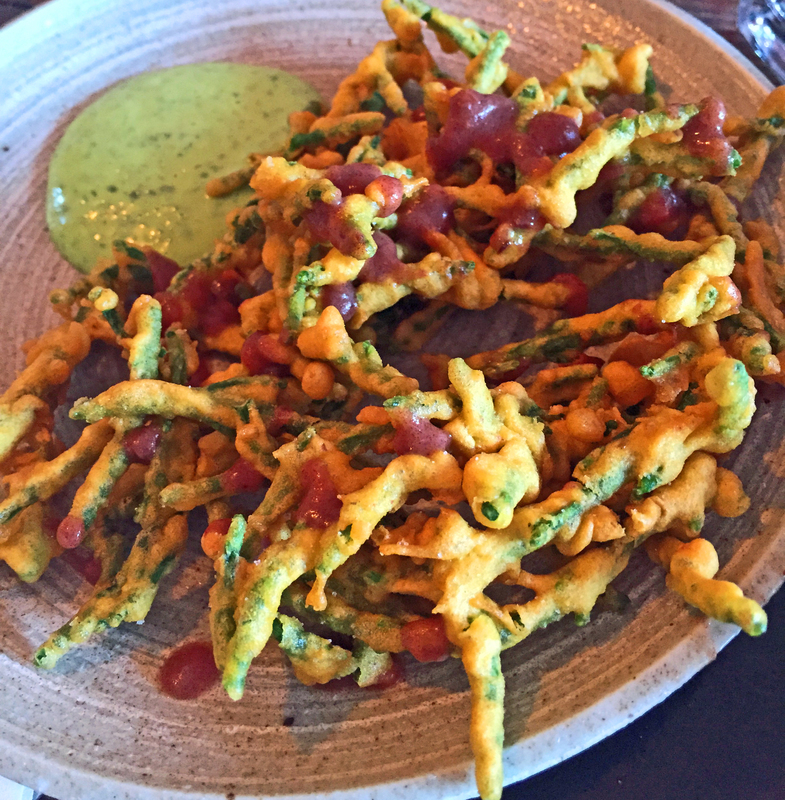 The Samphire Pakoras were not our favourite but we competently crisp. 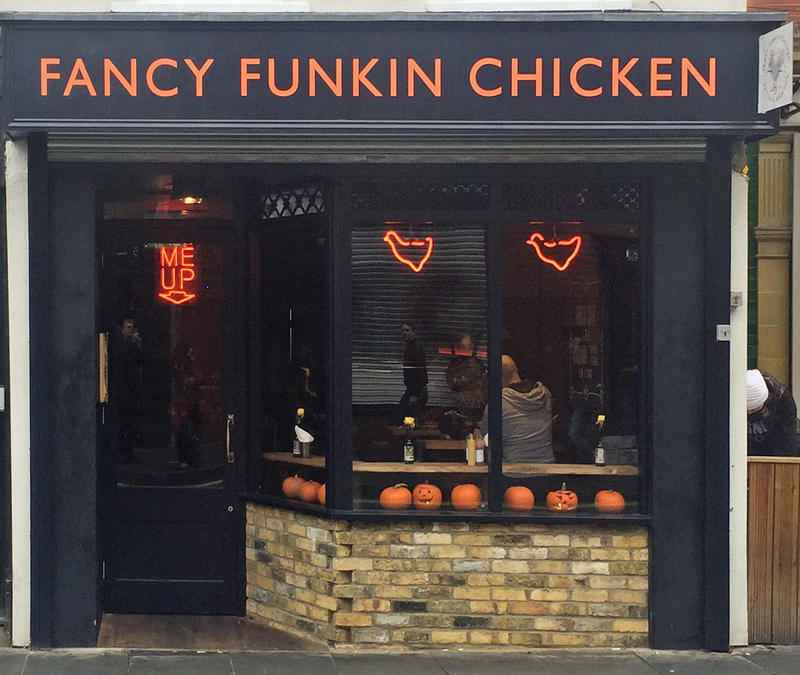 The fried chicken was great and the Vindaloo, while tasty and a good bit of meat, was not hot as the name ought to suggest – even for me. We accompanied the food with a couple of cocktails; an Old Narangi made of cardamom bourbon, marmalade and orange; and a Plummaharaja made from cardamom vodka, calvados, plum and ginger. Both were sweet and interesting with a lot of attention to detail, which might explain how long they took to arrive. Would we return – probably and to have the same food. The menu is short, so it’s easy for even a couple to try everything in a single visit. It is expensive at £44 before a tip, but that is partly explained by the cocktails. Nevertheless we did enjoy the food and ended up replete with not enough space to even try the Gulab Jamon with clotted cream ice cream, so it felt ok for a Friday night out. However, it’s not really a place to linger so don’t expect to make it a long night.